LUSKVILLE, Qc. — I was sitting in the mist, at the foot of a 1940s fire tower, 1,300 feet up, on 4-billion-year-old Canadian Shield rock. Across from me was a blue jay who wouldn’t pose for photos but was otherwise genial. The sweet scent of new growth just beginning to overpower the savory, dark smell of last fall’s decay made the climb up this little mountain worth it, despite a poor night’s sleep, terrible driving directions, a downpour, and heavy fog that curtained the path on my approach. The cloud cover had changed, though, as I reached the trailhead. Rather than solid gray, it broke up into several shades, striated and drifting. The sky had mostly rained herself out. 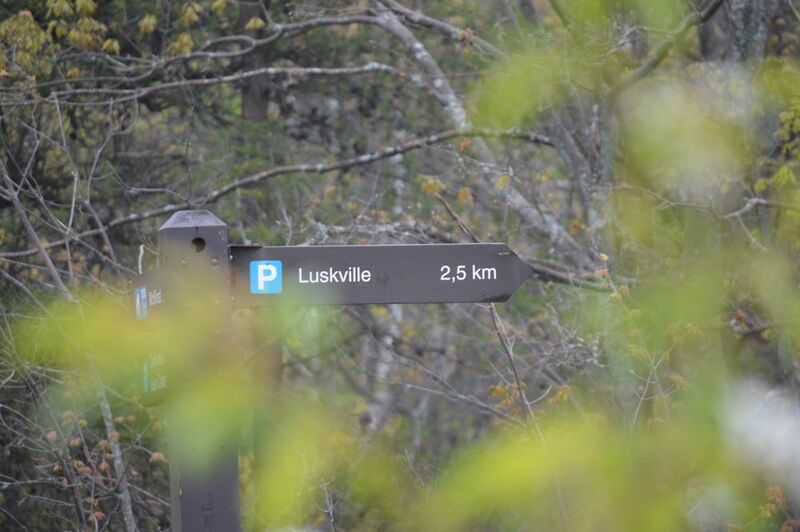 Parks Canada calls Luskville Falls Trail challenging, and they are not kidding around. The path is marked with arrows painted on rock and small blue signs that are so good at not interfering with nature that it’s sometimes hard to find them. For the first half of the climb up the Eardley Escarpment, one must use boulders and tree roots as footholds and haul oneself forward using thin trees that shower their leftover raindrops on one’s head and shoulders. It feels as though the climb might not end, even after the pause on the first rocky lookout, which offers a beautiful yet typical view of Southern Ontario. And then it is up yet more, to the second lookout, named Pontiac for the chief of the Ottawa nation. The Ottawa River Valley was Algonquin land generations before it was overrun with Lusks in the 1820s and then us, daytrippers who just want a good climb and a great view. Thanks to the chill and rain, I didn’t have to share the trail; nor did I have to share the view from the fire tower, except with that blue jay, who probably returned to his mate and laughed about hiding from my camera. 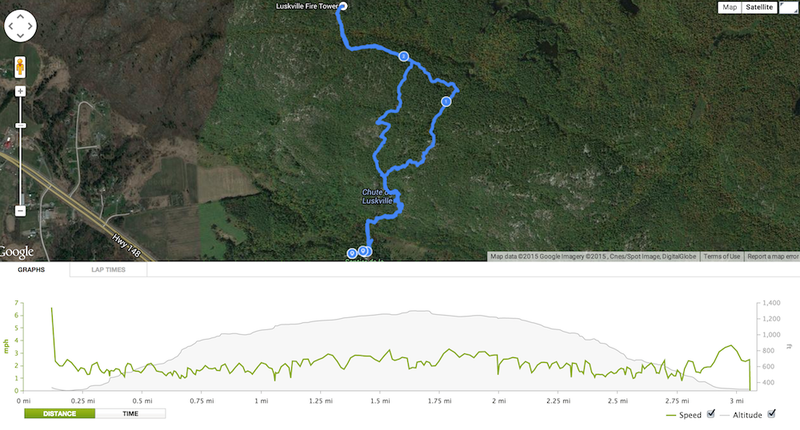 The Luskville Falls Trail gets three stroller wheels, but seriously qualified: I enjoyed my two hours heading up and down the mountain, but that’s because I was alone. This is no trail for a preschooler, and I’d hesitate before bring most grade-schoolers along for the hike. It’s wickedly steep and the rocks are slick after a rain. Falling up will get you skinned knees, but falling down could get you a broken neck. Wear your most comfortable shoes and don’t forget to bring water. If you’ve read any of my parks series, you won’t be shocked to hear that I forgot (since it was my first serious hike of the season) to wear bug spray: Guys, the mosquitoes will kill you. There are dry toilets at the base of the trail. That’s also where you’ll find garbage cans — there are no trash facilities on Gatineau Park trails, so please carry out whatever you carry in. The ups and downs of a walk in the park. 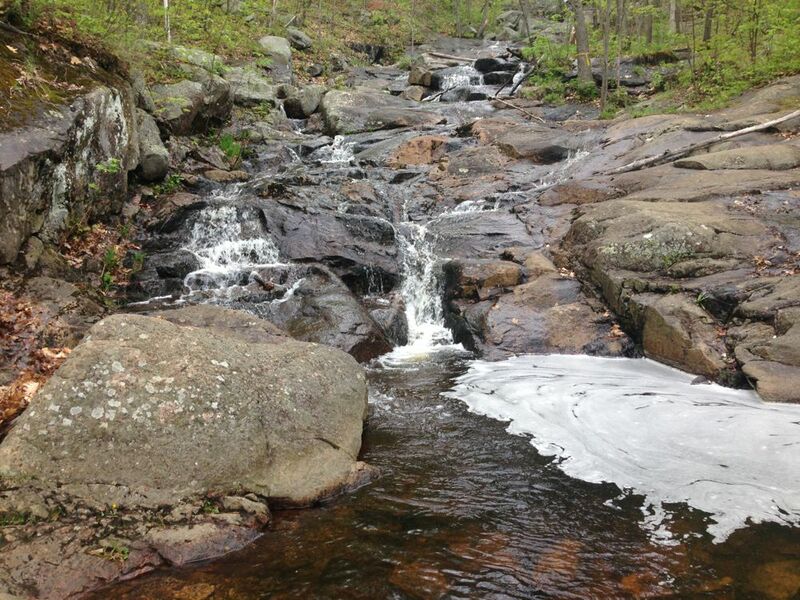 Previous Skinny dipping in a national park: My birthright?